Enjoy your garden and terrace view, dine out with friends overnight with these Solar Rechargeable Batteries. The Reliable Energy Supply ensures the right lighting – anytime you want.These are Especially developed for AAA- sized Solar Garden Lights.These have Optimized Capacity for Low Current Garden Lights which need High Frequency recharging cycles (almost daily).These batteries are Rechargeable hundreds of times without memory effect.These are Long lasting and Environmental Friendly Energy. 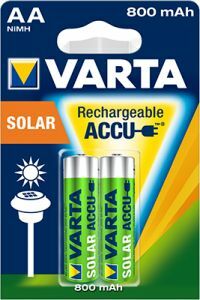 To Recieve updates and possible rewards for Varta AAA 550 mAh Accu Solar please sign in. To Recieve updates and possible rewards for Rechargeable Battery please sign in.